Tim Schenken's Formula 3 Brabham BT28 at Crystal Palace in May 1969. Copyright Chris Bennett 2014. Used with permission. Motor Racing Developments, the company behind the Brabham GP team and constructor of many successful production racing cars, lasted 31 years and four owners. Their production cars dominated F3 for much of the 1960s and were amongst the most competitive of F2 cars. Brabhams also won in Indycar racing and Tasman racing and were at times the most popular Formula B and Formula Atlantic cars. At GP level, Brabham won four Drivers and two Constructors championships and Jack Brabham remains the only driver to win the World Championship in a car bearing his own name. Approximately 720 Brabhams were built but the exact number can never be known for sure. This page provides a summary of the company's production and link to the pages which either summarise the research to date or are the home of active research projects. Very few Brabhams aren't being actively researched. Please email Allen at allen@oldracingcars.com if you can add anything. Brabham BT1 1961 1 Formula Junior. The original 'MRD' built in 1961 and retrospectively called the Brabham BT1. Brabham BT2 1962 11 Formula Junior. A development of the BT1. Brabham records have always said that 11 were built but decyphering them is proving difficult. Full histories available. Brabham BT3 1962 1 Formula 1. Full history available. Brabham BT4 1962 4 Intercontinental (2.5-litre). Three cars were built for the Internationals in New Zealand and Australia. A fourth was built in April 1963 for European hillclimbs. Full histories available. Brabham BT5 1963 2 Sports racing. Two were built using the 1.6-litre Lotus-Ford twin-cam engine. Brabham BT6 1963 20 Formula Junior. A further development of the BT2. Although first owners are known for all 20, the job of establishing histories for each car has barely begun. Full histories available. Brabham BT7 1963 2 Formula 1. Full race record. Brabham BT7A 1963 2 Intercontinental (2.5-litre). Two more cars appeared at the end of the season destined for the New Zealand and Australia Internationals. Full race record. Brabham BT8 1964-1966 12 Sports racing. Built to use BRM and Climax racing engines and highly successful. Full histories available. Brabham BT9 1964 13	 Formula 3. Brabham's first design for the new 1000cc Formula 3 was an evolution of the BT6. First owners are known for only seven or eight of the 13 cars built. Full histories available. Brabham BT10 1964 17 Formula 2. A highly successful new short-chassis derivative of the BT6 built for the new 1000cc Formula 2. Brabham records say that 17 were built but only 15 are known, together with their first owners. Greg Cusack's 'IC-6-64' may be one of the missing cars. Full histories available. Brabham BT11 1964 5 Formula 1. Full race record. Brabham BT11A 1964 5 Intercontinental (2.5-litre). As with the BT7A, one was built for European hillclimbs and the rest for the new Tasman series. Full race record. Brabham BT12 1964 1 Indy racing. Commissioned by John Zink and raced at the Indy 500 by Jack Brabham and in later races by Jim McElreath. Wrecked in testing late 1964 and replaced by a copy approved by MRD. Another copy was used by Mario Andretti to win the 1965 USAC championship and became the basis of the Brawner Hawks. Full history available. Brabham BT17 1966 1 Sports racing. A one-off Group 7 sports racer built around a 4.3-litre Repco engine. Later used in hillclimbs and sprints by George Tatham. Brabham BT19 1966 1 Formula 1. Originally built for the Climax f16 engine but reused as a Repco V8 car for Jack Brabham in 1966. Full race record. Brabham BT20 1966 2 Formula 1. Full race record. Brabham BT21 1966-1968 50 Formula 3. Effectively the 1967 F3 model although the first two appeared late in 1966 and Brabham show the final car being built in 1968. Developed from the BT18 but with a lower frame and smiller body. Research project. Brabham BT21A 1967 10 Formula Libre and Formula B. The 1600cc Ford twin-cam libre variant of the F3 BT21 were only rarely used in UK libre. Two went to hillclimbs, one to libre and the rest appear to have gone to the US for Formula B. The US cars may have been called BT21s in period to add to the confusion. Research project. Brabham BT21B 1968 31 Formula 3. A minor update to the 1967 BT21 which has proved very difficult to track as BT21s were misreported as BT21Bs. Research project. Brabham BT21C 1968 18 Formula Libre and Formula B. As the BT21A was the twin-cam version of the BT21, so the BT21C was the twin-cam version of the BT21B. Two cars went into UK hillclimbs but most went to the US together with second-hand BT21s making them very difficult to identify. Research project. Brabham BT21X 1968 1 Formula 3. A late-1968 works development car using a frame similar to the 1967/68 BT23 design that Schenken raced at the Brands Hatch Boxing Day meeting. Effectively the prototype BT28 and became Schenken's Sports Motors BT28/1 in 1969. Definitely not the later BT21 'Quattro' hillclimb car. Research project. Brabham BT22 1966 1 Formula Libre. Built along the lines of the 1964 BT11A with a 2.5-litre Climax. Said to have been built for Silvio Moser but went to Ernie Powrie in Scotland for libre instead. Later to New Zealand for Tasman. Full race record. Brabham BT23 1967 9 Formula 2. The first FVA-powered F2 model. Just nine built so these cars are reasonably well understood. Full histories available. Brabham BT23A 1967 1 Tasman/Repco. A one-off BT23 variant built for Jack Brabham to use in the 1967 Tasman series with a 2.5-litre Repco engine. Built before the F2 cars. Later to David McKay's team. Full histories available. Brabham BT23B 1967 3 Formula libre. Three variants of the F2 BT23 built with 2.5-litre Climax engines. One went into UK libre, one into UK hillclimbs and one into European hillclimbs. Full histories available. Brabham BT23C 1967-1968 13 Formula 2. The 1968 F2 version of the BT23, later used extensively in UK libre racing. The location of most of the cars is known. Full histories available. Brabham BT23D 1967 1 Tasman/Alfa. Built for and by Alec Mildren's team using a 2.5-litre Alfa Romeo V8 and raced in the 1968 Tasman series by Frank Gardner. Full history available. Brabham BT23E 1967 1 Tasman/Repco. Jack Brabham's 1968 Tasman series car; later to Bob Jane's team. Full history available. Brabham BT23F 1968 1 Formula B. Sold to Bill Gubelmann for the 1968 series. Full history available. Brabham BT23G 1968 2 Formula B. Two further FB cars for the 1968 series with a Hewland Mk 5 box instead of the FT200 in Gubelmann's car. Full histories available. Brabham BT24 1967 3 Formula 1. Full race record. Brabham BT25 1968 2 Indy car. Two works cars built for the 1968 season with a 4.2-litre Repco V8 and driven by Jack Brabham, Jochen Rindt and Masten Gregory; and also by Brabham and Peter Revson in 1969. Revson won a USAC race at Indianapolis Raceway Park in July 1969. Brabham BT26 1968 3 Formula 1. Full race record. Brabham BT27 not built Formula 1. A 4WD design that was not built. Brabham BT28 1969-1970 42 Formula 3. Another massive production run of 42 cars but split over two years with 24 being built in 1969 and a further 18 in 1970. Huge progress has been made on the identification of individual cars. Research project. Brabham BT29 1969-1970 29 Formula B. The production figure of 29 quoted in Lawrence is wrong on this occasion. A total of 48 were built: 19 built in 1969 and 29 in 1970. Nearly all exported to US so establishing chassis identities is proving quite difficult. Just three stayed in the UK. Research project. Brabham BT30 1969-1970 26 Formula 2. Like the BT28 and BT29, production of the BT30 was seriously delayed in 1969 and only eight appeared that season. A further 17 were built in 1970 plus a final car built to BT36 spec for Bob Jane in 1971. Full histories available. Brabham BT30X 1969 2 Hillclimb. 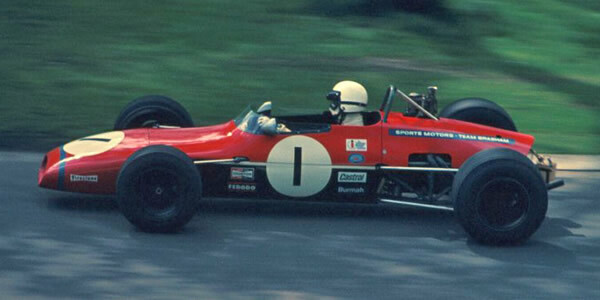 Brabham records say that two BT30X hillclimb cars were built but only one is known, the car driven by Mike MacDowel and fitted with a 2-litre Climax. Lawrence refers to the BT30X having a 1.8-litre FVA. Research project. Brabham BT32 1970 1 Indy car. One-off final Indy car with a standard 159ci (2.65-litre) Offy turbo engine and raced by Jack Brabham at Indy in 1970. Later sold to Patrick Petroleum. Brabham BT33 1970 4 Formula 1. Full race record. Brabham BT34 1971 1 Formula 1. Full race record. Brabham BT35A 1971 3 Formula Atlantic. These cars seem to have been intended for UK Formula Atlantic rather than US Formula B but were numbered with all the other BT35s and are hard to sort out. Research project. Brabham BT35B 1971 7 Formula B. Research project. Brabham BT35C 1971 27 Formula 3. These cars were numbered with the FB and F/Atlantic cars and referred to as BT35s in period. Although Lawrence says that 27 were built, the highest known BT35 chassis number is 52, implying that 37 F3s were built. It is possible that the ten 'extra' cars were built for the 1972 season, starting with BT35-44. Research project. Brabham BT35X 1971 4 Hillclimb. Chassis BT35X-1 and BT35X-2 are known but the other two may have been numbered with the F3 cars. Research project. Brabham BT36 1971 9 Formula 2. Full histories available. Brabham BT36X 1971 1 Hillclimb. A one-off car for Mike MacDowel and fitted with a Repco V8 engine. Won the 1973 and 1974 British Hill Climb Championship. Full histories available. Brabham BT37 1972 2 Formula 1. Full race record. Brabham BT38 1972 16 Formula 2. The first post-Tauranac design. A monocoque, the chassis numbering was started from 11 to make production look higher. This model appears to have been numbered separately to the BT38B and BT38C. Full histories available. Brabham BT38B 1972 5 Formula B. Numbered separately to the F2 and F3 models. Research project. Brabham BT38C 1972 14 Formula 3. Numbered separately to the F2 and FB variants. Research project. Brabham BT39 1972 1 Formula 1. Built for Weslake engine but not raced. Its BT38 chassis may have been sold off as a BT38. More details. Brabham BT40 1973 28 Formula 2 and Formula B. Nine built for F2 and 19 for Formula B. Research project. Brabham BT41 1973 21 Formula 3. The last of the production Brabhams. Brabham BT42 1973 6 Formula 1. Full race record. Brabham BT43 1973 1 Formula 5000. Full race record. Brabham BT44 1974 4 Formula 1. Full race record. Brabham BT44B 1975 4 Formula 1. Full race record. Brabham BT45 1976-1978 8 Formula 1. Full race record. Brabham BT46 1978 9 Formula 1. Full race record. Brabham BT47 not built Formula 1. A planned fan car. Brabham BT48 1979 4 Formula 1. Full race record. Brabham BT49 1979 9 Formula 1. Full race record. Brabham BT49C 1981 5 Formula 1. Full race record. Brabham BT49D 1982 3 Formula 1. Full race record. Brabham BT50 1982 5 Formula 1. The first turbo Brabham and therefore outside the current scope of OldRacingCars.com. Brabham BT51 1981 1 Formula 1. Unraced. Brabham BT52 1983 6 Formula 1. Four BT52s and two BT52Bs built. Brabham BT53 1984 5 Formula 1. Five built plus the BT52-derived test car. Brabham BT54 1985 9 Formula 1. Driven by Piquet, Francois Hesnault and Marc Surer. Saw Brabham's last GP win. Brabham BT55 1986 8 Formula 1. A lowline car which was remarkably unsuccessful. Driven by Elio de Angelis, Riccardo Patrese and Derek Warwick who joined the team after de Angelis' fatal accident. Brabham BT56 1987 4 Formula 1. The last of the Ecclestone Brabhams, driven by Patrese and Andrea de Cesaris. Brabham BT57 1988 2 Procar. Built as a prototype for Alfa Romeo with a V10 engine and Alfa 164 body. Brabham BT58 1989 5 Formula 1. Brabham returned after a year's absence in the ownership of Joachim Luhti. The BT58 used customer Judd engines. Brabham BT59 1990 5 Formula 1. The original BT59 featured a Judd EV V8 but was replaced by a Yamaha engine for early 1991. Brabham BT60 1991-1992 6 Formula 1. A BT60Y with a Yamaha engine was bult for 1991 followed by a Judd-powered BT60B derivative for 1992. Brabham withdrew after the 1992 Hungarian GP when Ted Ball's Landhurst Leasing went into liquidation, leaving Brabham's owners Middlebridge Group Limited with no further finance. The end was very messy, with Landhurst Leasing's joint managing directors pleaded guilty to corruption charges in 1997. A lot of this story is in Oliver Shah's 2018 book "Damaged Goods", the inside story of 'Sir' Philip Green and his business associates. All and any help would be gratefully received. Please e-mail Allen at allen@oldracingcars.com if you can add anything.